Commodore Sir Laurence Street AC KCMG QC, the fourteenth Chief Justice of the NSW Supreme Court and former Lieutenant-Governor of New South Wales, died on 21 June 2018, and a state funeral was held in his honour on 5 July 2018 at the Sydney Opera House. The following obituary was written by The Hon Arthur R Emmett AO QC, Acting Judge of the New South Wales Court of Appeal, and will be published in the forthcoming July issue of The Australian Law Journal. Laurence Lillingston Whistler Street died 12 days short of his 92nd birthday on the night of the winter solstice, 21 June 2018. Although he had a privileged life, it was one of great service. He was the fourth and last child of Kenneth Whistler Street and Jessie Mary Grey Street, each of whom achieved much in their respective lives. At the time of Laurence’s birth in 1926, his grandfather, Philip Whistler Street, was the Chief Justice and Lieutenant Governor of New South Wales and his father was a barrister. Laurence was named after his uncle, Laurence Whistler Street, who was killed at Gallipoli in 1915 at the age of 21. In October 1931, Kenneth Street was appointed as a judge of the Supreme Court, joining his father on the Court, where they occasionally sat together on Full Courts. On those occasions, the third member of the bench was referred to as “the Holy Ghost”. In 1950, Kenneth Street, was appointed as Chief Justice and Lieutenant Governor, following his father in those offices. When Laurence finished school in 1943, at the age of 17, he enlisted in the Royal Australian Navy. He began below decks as an ordinary seaman but, after initial training at HMAS Kuttabul, was selected for the Officer Training School, from which he graduated as a midshipman, with the unique mark of 100%, the first candidate to do so. He saw active service in the Pacific aboard the corvette, HMAS Ipswich, and was aboard HMAS Ipswich in Tokyo Bay when General Douglas MacArthur received the Japanese surrender. After demobilisation in 1947, Laurence, unsurprisingly, undertook a degree in Law at Sydney University Law School. While at Law School, Laurence was associate to Mr Justice William Owen, who was the third generation of his family to hold office as a judge, something that Laurence was to emulate. William Owen was afterwards appointed to the High Court of Australia. Laurence graduated with honours as Bachelor of Laws and was admitted to the Bar of New South Wales in 1951, where he read with Bruce Macfarlan, who became a Supreme Court judge, sitting in the Commercial List. One of Laurence’s pupils was Kenneth Handley, who was subsequently appointed to the New South Wales Court of Appeal. One of Handley’s pupils was David Bennett, subsequently Commonwealth Solicitor-General. One of Bennett’s pupils was Robert Macfarlan, Bruce’s son, who is now a member of the Court of Appeal. Laurence’s second son, Alexander, read with Robert Macfarlan, completing a unique circle. In 1952, Laurence married Susie Watt, the daughter of Ernest and Ruth Watt. Ernest was the scion of one of the founders of Gilchrist Watt and Sanderson Ltd, a well-known shipping agent and a regular litigant in the Commercial List. Susie’s grace and her practical sensibilities were a great support for Laurence in his professional life, particularly after he was appointed to the Supreme Court. Laurence and Susie had four children, Sylvia, Kenneth, Alexander and Sarah. At the Bar, Laurence established a stellar reputation for his sound understanding of legal principle, particularly in commercial and admiralty law and insolvency. He was a superb advocate and appeared regularly with Sydney’s leading counsel. Urbane and suave, Laurence acquired the nickname of “Lorenzo the Magnificent”, after Prince Lorenzo de Medici. His princely demeanour served him well in court. On one occasion, when appearing for a defendant company owned by the Belgian government, he announced to a District Court judge that he had the honour to appear for the King of the Belgians, who did not condescend to submit to the jurisdiction of a foreign court. Laurence’s submissions were so beguiling that the plaintiff’s counsel ended by apologising on behalf of his client for inconveniencing His Majesty. Laurence was appointed as Queen’s Counsel in 1963 but, although he appeared as silk in the Privy Council, he was not destined to have a long career as senior counsel. One of his successes as senior counsel was in the Royal Commission into the tragic collision between HMAS Melbourne and HMAS Voyager in 1964, which resulted in the loss of 82 lives. Laurence appeared for the interest of Captain Duncan Stevens, the commander of HMAS Voyager, who had died in the collision. The commander of HMAS Melbourne, Captain John Robertson, who was without fault, eschewed legal assistance. Laurence’s skill led to findings adverse to Captain Robertson. However, Laurence’s humanity caused him to perceive the great disadvantage under which Captain Robertson laboured and Laurence was instrumental in the establishment in Sydney in 1964 of the Naval Reserve Legal Panel. Laurence was promoted to the rank of Commander and named as the first head of the Panel. He has been succeeded by eminent jurists over the more than 50 years of the Panel’s existence. Two of his children, Lieutenant-Commander Sylvia Emmett and Commander Alexander Street, are presently members of the Panel. Laurence’s insolvency practice resulted in his appointment as Challis Lecturer in Bankruptcy at Sydney University Law School, emulating his grandfather. In 1965, it was necessary for him to teach the intricacies of bankruptcy to his last class, under the shadow of proposed new bankruptcy legislation. As a member of the class, I can vouch for the skill with which Laurence expounded clearly and intelligibly the underlying concepts of bankruptcy by reference to the existing bankruptcy legislation as well as the proposed new legislation, which became the Bankruptcy Act 1966 (Cth). At the end of 1965, Laurence was appointed to the Supreme Court and sat in Equity from the time of his appointment. In 1972, he was appointed Chief Judge in Equity, again following in the footsteps of his grandfather. As a trial judge, Laurence developed an excellent relationship with the Equity bar, relying on regular Equity practitioners to give assurances that the papers and evidence were in order for the granting of the relief sought. A practitioner who failed Laurence’s trust was thereafter at a considerable disadvantage. On one occasion, that cooperation between Bench and Bar enabled Laurence to dispose of over 280 cases in the Company List in a single day, without assistance from Masters or Registrars, a feat with which he was justly pleased. I saw part of that feat as instructing solicitor in several of the matters. As a result of Laurence’s commercial experience and expertise at the Bar, the Equity Court, and after 1972, the Equity Division of the Supreme Court, became the desired forum in Australia for the resolution of commercial disputes. Laurence’s capacity, as a trial judge, to get to the heart of a case was renowned. By detailed preparation of material, he was able to give prompt judgments that almost invariably stood up on appeal. In short cases, he regularly gave ex tempore decisions, when he would line up the affidavits and law reports and move up and down the bench, referring to documents and to authorities, delivering concise but comprehensive judgments in clear and unambiguous language. Laurence was equally at home with complex cases. For example, in July 1972, Ampol Petroleum Ltd brought proceedings to set aside a very substantial allotment of shares made by RW Miller Holdings Ltd to Howard Smith Ltd as a means of defeating a hostile takeover offer by Ampol. The proceedings, which involved significant questions of directors’ duties and powers, were brought on urgently and, by December 1972, Laurence had conducted a hearing of some three weeks and given judgment setting aside the allotment. Sydney’s leading commercial counsel appeared for the various parties involved in the proceedings, and despite occasional tension between them, Laurence’s exerted authority and urbanity ensured that the litigation was conducted with the highest level of respect and competence, something I saw first-hand as instructing solicitor for Ampol. An appeal straight to the Privy Council, which was possible at the time, was dismissed. The members of the Privy Council showered considerable praise on him for the speed and competence with which the proceedings had been heard and disposed of. In the early 1960s, Laurence and Susie acquired “Golden Valley”, a property bordering on the Wollondilly River at Canyonleigh, where they bred quarter horses and from time to time ran steers, conducting the operations entirely by themselves, even after Laurence’s appointment to the Supreme Court. After Laurence adjourned his Court on Friday afternoons, Susie would collect him in Macquarie Street, dressed in his striped trousers, black jacket and Homburg, and the family would then drive to Golden Valley with their various pets, including a kangaroo and a wombat. Laurence had an abiding love for the poetry of “Banjo” Paterson, who had practised in partnership with his great uncle, John William Street. The “dingy little office” referred to in “Clancy of the Overflow” was the office of Street & Paterson in Phillip Street Sydney. Laurence would entertain his children on the long drive to Golden Valley by reciting by heart “Clancy of the Overflow”, “The Man from Snowy River” and many others. Riding “Doctor”, a handsome chestnut stallion, Laurence would lead his family on expeditions to picnic spots on Golden Valley, where they would boil a billy and cook on an iron plate over a fire lit by Laurence by rubbing sticks together, and camp under the stars. It was quite disarming to see the urbane and suave Laurence breaking in foals, drenching horses and handling bullocks in the cattle crush. When Sir John Kerr resigned as Chief Justice to become Governor-General in 1974, Laurence was appointed as Chief Justice and Lieutenant-Governor. He thus became the third generation of his family to hold those offices. In 1976, he was made a Knight Commander of the Order of St Michael and St George, an honour traditionally conferred on a colonial chief justice, as Laurence was pleased to call himself. While Kenneth Street had seen his son become the third Street to hold office as a judge of the Supreme Court, he did not survive to see him become the third Street Chief Justice. Most of Laurence’s sitting time as Chief Justice was spent presiding in the Court of Criminal Appeal. His capacity to give ex tempore judgments enabled that court to achieve a high reputation for speed and justice, yet engendering with litigants a sense of having had a fair hearing. However, while Laurence brought a keen, analytical mind, together with consistency and efficiency to the administration of criminal justice, his appointment as Chief Justice so early in his judicial career resulted in the loss to the commercial community of the country’s leading commercial judge. Nevertheless, Laurence’s understanding of commerce enabled him to see the importance of the Commercial List. He persuaded Andrew Rogers to accept an appointment to the Supreme Court and was instrumental in having a separate Commercial Division of the Supreme Court established, of which Andrew Rogers was appointed as the first Chief Judge. Laurence supported the innovations introduced in the Commercial Division, which became a leading innovator in the conduct of commercial litigation in the common law world. Shortly after Laurence’s appointment as Chief Justice, stirrings began for the creation of a generalist, superior federal court, which Laurence opposed, arguing that there was no reason why the State courts could not continue to exercise federal jurisdiction as they had been doing since federation. However, in 1976 the Federal Court of Australia was created as a separate, generalist court exercising federal jurisdiction. Nigel Bowen, who had succeeded Laurence as Chief Judge in Equity, was appointed as the first Chief Judge, later Chief Justice, of the Federal Court of Australia. At much the same time, the Family Court of Australia was created. Jurisdiction that had previously been vested in State Supreme Courts was conferred upon the two new courts and the Federal Court was given certain of the first instance jurisdiction that had been exercised by the High Court. In 1977, judges first sat in the new Law Courts Building in Queens Square, accommodating both State and federal judges. Laurence had a hand in the design of the State floors and presided over the first sittings of the Supreme Court in the new ceremonial Banco Court. The judges of the new Federal Court occupied the higher floors of the building. However, tensions developed between Laurence, as Chief Justice of NSW, and Nigel Bowen, as Chief Judge of the Federal Court. The tensions manifested themselves in two ways. First, Laurence confirmed the authority of the judges over their courthouse. As originally designed, there were two lobbies in the new building, one for the State and one for the Commonwealth, and Laurence directed that the doorway between the two lobbies be closed temporarily, preventing access from one to the other. Secondly, a disagreement arose as between Laurence and Nigel Bowen as to who should take precedence in connection with the traditional opening of law term service at St James Church, King Street, when it was customary for the State judges to process to Sydney’s traditional legal church in ceremonial robes. Laurence’s view, that the service was a State affair and not a Commonwealth affair, prevailed, with the consequence that federal judges have never participated in the procession and, to the extent that they have attended the church service, they have done so in “mufti”. One of Laurence’s important achievements as Chief Justice concerned the establishment in 1987 of the Judicial Commission of New South Wales, which he regarded as the most public and difficult battle that he fought as Chief Justice, steering a course between Scylla and Charybdis. In exchange for what was perceived to be a significant incursion into judicial independence, the judges accepted the benefits of the education and sentencing functions provided by the new body. The compromise that he brokered with the State government, which was perceived as a significant victory for the judges, was that the new body would be independent of the executive. Laurence was appointed as the first head of the Judicial Commission when established. At the end of 1988, Laurence resigned from the Supreme Court after 23 years as a judge, 14 of them as Chief Justice. In 1990, Laurence and Susie were divorced. Susie married John Rankine, an eminent Australian civil engineer, and Laurence married Penny Ferguson, who had been private secretary to the Governor. Laurence and Penny had one child, a daughter, whom they named Jessie, after Laurence’s mother. Following his resignation, Laurence embarked on a new career in Alternative Dispute Resolution. 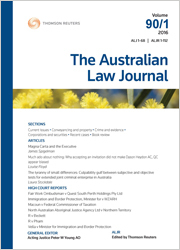 His personal charm and understanding of and ability to deal with people, as well as his deep knowledge of the law, enabled him to establish a unique practice throughout Australia. He became known as “the Father of Mediation” both in Australia and internationally. Laurence also chanced his arm in commerce and sport, becoming chairman of John Fairfax and Sons Limited and chairman of the National Rugby League judiciary. In 1989, Laurence was appointed as a Companion of the Order of Australia. Following his death, Laurence’s life was recognised at a State Funeral in the Concert Hall of the Sydney Opera House conducted by Dr John Vallance, State Librarian. Tributes were given by Penny Street, his widow, by the Honourable Malcolm Turnbull MP, Prime Minister, by the Honourable Murray Gleeson AC QC, former Chief Justice of the High Court of Australia, who succeeded Laurence as Chief Justice of New South Wales, and by Rear Admiral Jonathan Mead, Fleet Commander of the Royal Australian Navy. Readings were given by the Honourable Tom Bathurst AC, the Lieutenant-Governor and Chief Justice of New South Wales, by the Honourable Andrew Rogers AO QC, and by each of Laurence’s five children. The ceremony was attended by over 1000 people and ended with the “Last Post” and “Reveille” by a Navy bugler, and Purcell’s “Funeral Sentences for Queen Mary”, played by the brass and percussion of the Sydney Symphony Orchestra, as Laurence’s coffin, draped in the White Ensign and bearing Navy sword and cap, was borne from the Opera House by serving sailors. Laurence was cremated at Northern Suburbs Cemetery following a private service conducted by the Rev Andrew Sempell, Rector of St James’s, King Street. Laurence is survived by his three daughters, Judge Sylvia Emmett of the Federal Circuit Court of Australia, Sarah Farley, a legal recruiter, and Jessie Street, a law graduate, and his two sons, Kenneth Street, a successful Southern Highlands businessman, and Judge Alexander Street, also of the Federal Circuit Court of Australia. He is also survived by 15 grandchildren and 5 great grandchildren.